I recently drove the long and fatiguing trip from Melbourne to Sydney in order to visit some family who live there. As my GPS kept constantly reminding me every few hours, breaks are essential on a trip of this length in order to stay fresh and alert on the roads. If you make this trip however, you will notice the plethora of trucks that constantly traverse this road in order to deliver goods from one state capital to the other. To accommodate for these trucks, there are a host of truck stops along the highway. Some of these stops have been adapted so that one can take a break, fill up their vehicle, have a bite to eat and in many countries the option to wash ones truck has become available. In the USA, these truck stops are big business. Companies who own these truck stops will naturally have many in different locations and an established customer base. With this come loyalty cards to encourage repeat patronage and many different services offered. In order to manage this it is evident that an electronic process is required to keep data between the different stops centralized and accessible from anywhere. Not only would manually moving paperwork be incredibly inconvenient for the customer and company, but also it is incredibly easy to make mistakes leading to decreased productivity and unhappy customers. Clearly this will lead to a loss of business and outstanding payments due to the errors made in invoicing. Enter the Datamax PrintPAD. The PrintPAD, one of the popular Datamax-O’Neil Portable Printers, has a touch screen as well as a receipt printer that means that data can be easily entered in and a receipt printed and issued on the spot. It is perfect for integrating many truck stops together to a centralised location as files can be pulled easily on the computer rather than having to fish through manual paperwork in order to find previous receipts. It is built rugged so that upon dropping it won’t break and can handle the usual bumps that come with the job. Further to this as truck stops often have washes; it is built to endure the harsh conditions it might be exposed to. Datamax’s PrintPAD further solves the problem of loyalty cards through its magnetic strip reader. 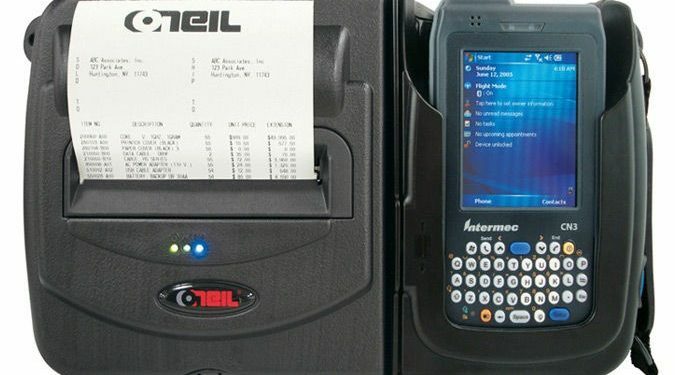 The handheld computer is programmed to be able to read the cards and download the information on the customer once scanned making the process quick and easy. It becomes evident that computerising systems in a company can have a clear positive impact upon the productivity of the business and will pay for itself in a relatively short time. Truck stop companies have saved tens of thousands of dollars through utilizing this technology and minimizing time spent and errors made by employees. The old adage comes to mind that its better to work smarter not harder and by integrating barcode printers systems like the PrintPAD into the running of a company this is a step in the right direction.